The Connect Pulse sensor has been specially developed to monitor cryogenic liquids such as NH3. The CP is designed to retrofit your tank's existing analog sensor with a digital one. CP is based on Hall-Effect Technology which, in cryogenic applications, replaces the magnetic dial chamber on the tank's float gauge with an output connection that correlates the tank level to the magnetic orientation of the float. This information is sent to our on-board microprocessor and reported to our web interface as tank level in units or percent full. We can establish alarm points based upon this signal to alert the user when each monitored tank needs attention. 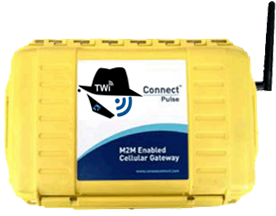 The Connect Pulse has a built in cellular broadband gateway giving it the ability to relay its data over cell tower to the TWI cloud. Connect Pulse also has a built in GPS device which will report the location of your mobile tanks on a map in our web interface. This feature combined with the TWI's web interface improves logistical efficiency for filling stations who can now know where and when a mobile asset is empty and on it way back. GPS also helps fight the growing theft of NH3 tanks by meth dealers. The Connect Pulse is an essential machine to machine device to protect and better use of your investments. © 2019 Peabody Engineering & Supply, Inc., 13435 Estelle Street, Corona CA 92879 (951) 734-7711 All rights reserved.